QuarkNet is a National teacher enrichment program sponsored by the National Science Foundation and the U.S. Department of Energy. 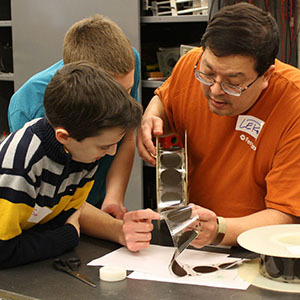 Since its inception in 2003, Purdue's QuarkNet Center has been dedicated to the engagement of high school STEM teachers and their students in cutting-edge high-energy particle physics research. The focus of the QuarkNet Center at Purdue is longitudinal content-based professional development for grade 9-12 STEM teachers, specifically in the areas of Physics, Mathematics, Astronomy, and Technology. In addition to professional growth and enrichment, teachers are provided the loan of a cosmic ray detector for use in their classroom, and may enroll their students in our annual MasterClass day of activities. 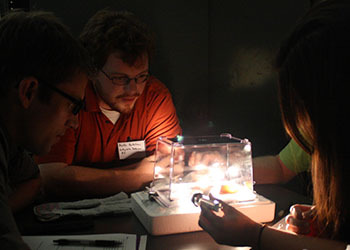 The QuarkNet Summer Teacher Institute is a week long on-campus program that provides grade 9-12 STEM teachers opportunities to interact with and learn from scientists engaged in research in high energy particle physics, cosmology, and astrophysics. 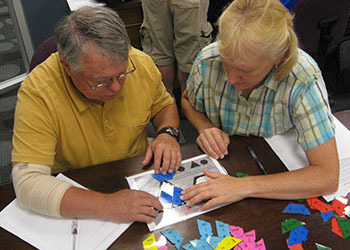 Teachers work together to develop and pilot instructional materials and hands-on activities that can be incorporated into their teaching to be able to engage their students in aspects of physics often difficult to address in traditional curricula. 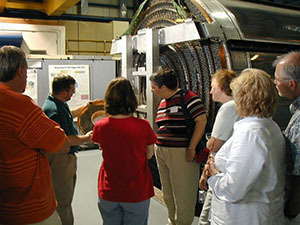 For example, the Lifetime of a Muon experiment provides a tangible way to introduce students to relativistic behavior. Our goal for teachers is to develop a deeper understanding of fundamental principles of physics, an appreciation for the machinery of modern science, and to learn how concepts related to radiation from outer space have and continue to impact technology and our daily lives. Learn more about the Summer Institute for Teachers. 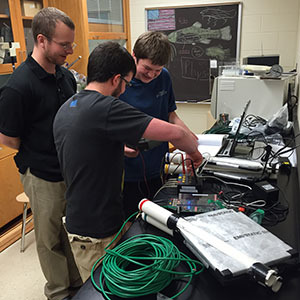 QuarkNet Data Camp is a week-long summer study and research opportunity held at Fermi Lab. Teacher teams work with researchers in the quantitative analysis of LHC data, and explore various classroom activities in the QuarkNet Data Portfolio that help teachers incorporate high-energy physics concepts into their instruction. Many of these activities utilize real data from CMS or other experiments such as ATLAS, LIGO, TOTEM and the QuarkNet cosmic ray detectors. Successful completion of this phase of the workshop will result in teachers developing an implementation plan that they can try with their students the following year. Travel expenses (hotel and flights) are covered by QuarkNet; a per diem allowance is provided for meals; and each teacher receives a $500 stipend for the week. Each year about 5000 high school students in 22 countries come to any one of about 80 nearby universities or research centers for one day to learn about unraveling the mysteries of particle physics in QuarkNet's International MasterClass. International MasterClass provides a tangible way for high school teachers and their students to come together with the high energy particle physics research community, dedicated to the exploration of still answered questions about origins of matter and forces in our universe. Learn more about the QuarkNet MasterClass.